Off. . . To. . . 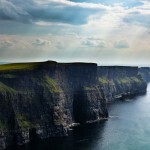 Ireland!! May 12th, 2015 by Terri Brisbin & filed under My Lady's Private Journal | Comments Off on Off. . . To. . . Ireland!! On Wednesday, I’ll be heading out again – as usual in the springtime for me — but this time it’s a first — I’m going to Ireland for the first time! 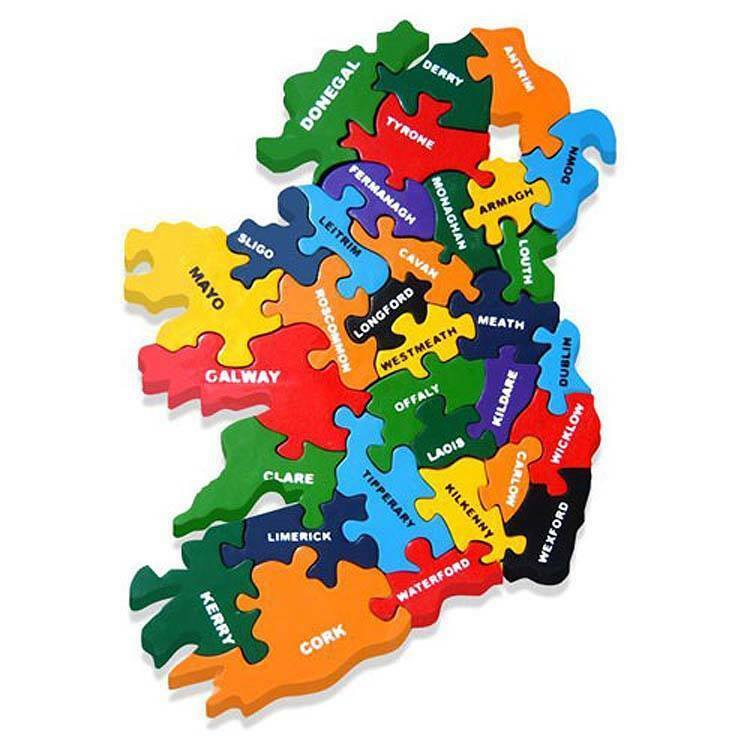 Although I’ll be on my own for a couple of days, I’ll be meeting writer friends in Dublin and then traveling south and west and out to the Dingle peninsula to spend a week writing… A dream trip for certain. 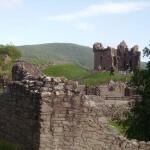 And, as I did on my last trip to Scotland in 2009, I’ll be posting some touring, traveling and research tidbits here on my website blog….and photos, of course! These photos are not ones I’ve taken but I hope to have some that will rival them…..and remind me of the magic and mystery of the place long after I arrive home. So, cross your fingers and wish me luck as I set out alone….in a car…on the other side of the road!! Talk to you soon!! It’s been at least a couple of years since my area of southern NJ had a really good snow storm, but we caught up today with a Nor’easter that’s still dumping snow here and up most of the MidAtlantic and New England coast. I’m like a 4 year old on Christmas eve….I’ve been watching it snow all day. And taking some photos, too. Cool, huh?! 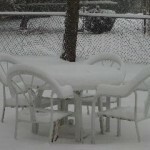 And it’s still snowing with the heaviest snow expected to end around 10 pm tonight and all the snow to be over by Sunday morning….. Anyone else in the storm’s path? Everyone doing okay? 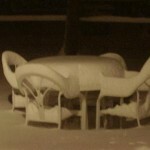 Stay warm….stay safe! 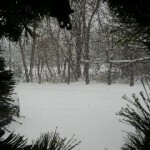 December 16th, 2009 by Terri Brisbin & filed under My Lady's Private Journal | Comments Off on The Winter Solstice…. The actual beginning of winter is coming up next week on December 21 — the winter solstice when the sun stops its southern journey and wobbles just a bit before heading back north. 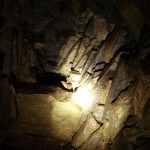 On my trip to Scotland, I visited Maes Howe, a Neolithic tomb in Orkney, where the solstice is marked in a special way. At sunset on December 21, the rays of the setting sun enter the entrance tunnel of the tomb and strike the back wall. It actually happens for several days before and after the solstice and now there’s a live webcamera on their website, so you can check it out. 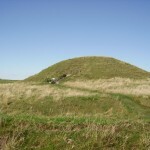 Visit www.maeshowe.co.uk and watch it happen live….each day until early January…. I will be! I still can’t believe I was inside the tomb looking out just a few months ago. Maybe one day I’ll be there to watch the sun come in…. I’m all packed up and ready to drive back to Glasgow in the morning (to catch a plane first thing Tuesday morning) so this is the last time I’ll be able to post before I get home. The little guesthouse where I’m staying has a dial-up connection I may be able to use, which doesn’t sound promising, so I’m not planning on it. Anyway, I just can’t believe it’s almost over. Invermoriston is a small village located when Glen Moriston meets Loch Ness, about half-way between Fort Augustus and Urquhart Castle. It has one of Telford’s (major British architect in the early 1800’s) bridges though the main A82 road goes over a much newer one. By small, I mean a collection of houses, a bike/kayak rental store, a small hotel (with a pub), a clog shop, a store/post office and a small cafe. Since I woke to the SUN! !, I walked from the apartment where I’m staying across the Telford Bridge (climbed out the other side since it ends in a huge ditch!) 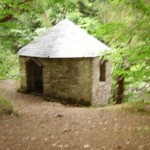 and then I visited Columba’s Well. Apparently, back in the late 6th century, the Irish monk was traveling through Scotland (from his monastery on Iona) trying to convert the heathen Picts and he visited the area. 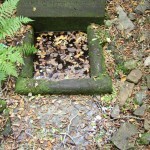 This well was known to be poisonous but he blessed it for all time and it was then safe to drink or touch. 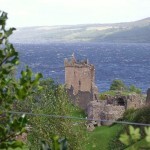 There’s also an old story that this spring became Loch Ness, but no one’s really sure about that! I walked on, crossing the main road and going through a gate towards Invermoriston Falls. 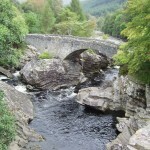 The walk was great — along the river as it moved from under the bridges to empty into Loch Ness. And the next surprise is called the Summer House. 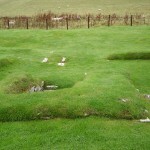 This is also called the Lady’s House because the laird’s wife would entertain friends there while the laird was hunting or doing other lairdly things. 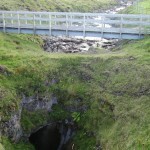 It has several windows that open to look over the river and falls below it. The falls were nice, the sound was inspiring and, even better, I spied a cave on the other side of the river that gave me more ideas for my next book…. The walk took about 40 minutes and then I spent the afternoon writing a bit, catching up on email and then took a short drive down to Fort Augustus — where the locks make it possible for boats to travel from River Oich onto Loch Ness and farther north on the Caledonia Canal. And for the first time, I watched a boat moving through the locks. Unfortunately, I’d left the memory card out of my camera and had to take photos with my cell phone! LOL! 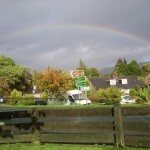 By the time the boat finished some storms moved through and then the sun was out again – creating the most lovely rainbows for my drive back to Invermoriston! I could actually see where this one ended as I drove under it…wild…simply wild! By the time I got to my apartment the rain was gone again. This morning was gorgeous! 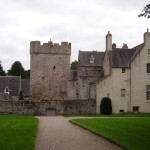 Sunny, windy, cool (about 55-60 degrees) so I set off right after breakfast for my last castle visit — Urquhart. Which I’ve learned is pronounced ‘Er’ – ket’ not urk-hart as I’ve been saying all this time. I got there early and there were only about 6 other cars in the car park and only one bus. So, I flashed my Great British Heritage Pass (look into it if you’re visiting the UK – it’s only for sale to non-residents) and got right in. There’s now a movie about the castle’s history that ends very dramatically with the curtains opening to reveal the ruins in front of you! 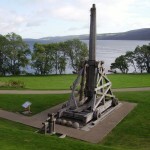 Urquhart is built on many levels which means. . . steps!! All over the place — uphill in both directions again! 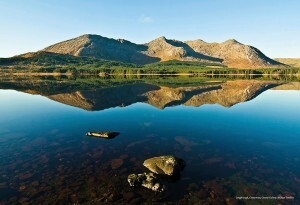 But it was a beautiful morning and the breezes off the loch were cool so I just enjoyed it all. I didn’t climb the main tower – I’ve done that before – so I focused on the other areas of the castle where I hadn’t walked before and took lots of photos before several busloads of more tourists arrived and it became too crowded. Even the workers on duty at the dam today were watching. It was amazing to watch these people controlling these little boats with only one double-ended oar, body-twisting and arm-power. 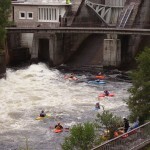 Once they got into position, they went down the rapids either by themselves or in small groups. 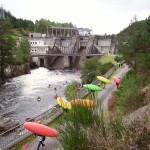 So, if you like to kayak, this is a place to put on your wish-list! Okay — I have a long day of driving in heavy rains (according to the latest weather guess) so I’m heading off now. It’s been wonderful sharing my trip with you all. Thanks for your comments – public and private. See you back in the States! Ferries and Castles and the SUN! So, after walking for miles, crawling into caverns and tombs and chambers and absorbing the wild and sometimes stark beauty of Orkney, I boarded the overnight ferry on Monday night from Kirkwall to Aberdeen. . . and found the SUN!! Yes, it was hiding on the east coast of Scotland all this time. I didn’t get a cabin for the crossing so I relaxed and slept some in a recliner in a ‘quiet’ lounge. Well, quiet except for the crying two-year-old who didn’t quite understand the concept of sleeping on a ship! I drove out of the ferry car park in Aberdeen on Tuesday morning and promptly got lost in the city! LOL — I think I was so stunned to see the sun I couldn’t remember the directions to the museum I wanted to see before heading to my next stop. So, I set the GPS for Banchory and drove off down the A93 towards the area known as Royal Deeside – royal because of Queen Victoria’s interest in the area (Balmoral, her Highland retreat as well as the current Royal family’s) is just down the road from Banchory and Deeside because the River Dee runs through it. 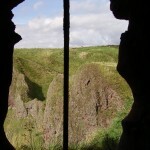 I was able to get into my room at the Burnett Arms Hotel – a former coaching inn – and decided not to waste a moment of sunshine and headed off to my primary destination in the area – Dunnottar Castle! There simply is nothing I can say to describe the dramatic approach to this castle. 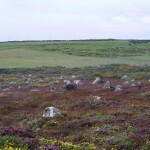 It sits out on a promontory into the North Sea which is separate from the mainland approach. Although these ruins are ‘new’, there has been a fort or castle here since Pictish times and it has been a religious and political stronghold through the ages. 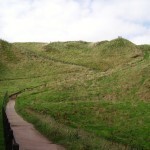 The walk from the car park is about 1/4 mile and the castle rises into view . . . and then you realize you must climb down one cliffside and up the other to get inside! 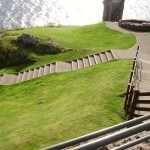 Which brings me to . . . . 180 steps down! Yeppers! I counted them – well, I counted them on the way back up because I wanted to keep focused and wanted to remember how many I’d climbed…if I survived! And I did! 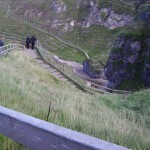 Once you reach the bottom it’s back up the other side which is steep but doesn’t have as many steps involved and you reach the entrance to the keep. In a nice twist, you don’t actually pay for admission until you get inside the keep – so if you don’t make it, at least they don’t charge you! LOL! 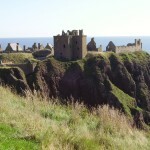 One of the reasons why Dunnottar was so difficult to capture was its location and structure. Attackers were themselves targets from inside since all entrance had to come from below. 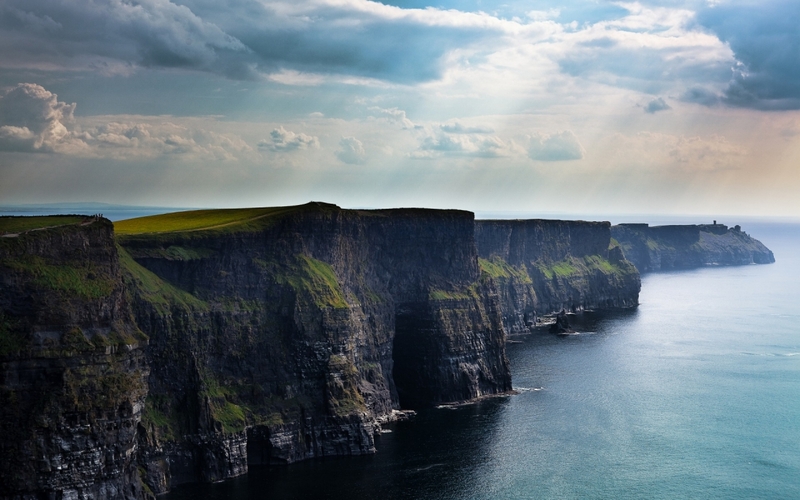 With the rough cliffs and rocky coast, an attack or entrance by sea was nearly or completely impossible. BTW – this is where the Honours of Scotland were hidden for months from Cromwell’s forces until they were smuggled out by a minister’s wife and buried in a local church. And, yes, I asked about the sword and how she could have done that when I saw the Honours at Edinburgh Castle — the sword is ceremonial, made of mostly gold and therefore malleable…er…bendable! It was probably bent in half and hidden under her cloak or skirts. The docent even pointed out the thin line and marking on the sword where they believe it was bent. Who’da thunk? So, after spending more than an hour touring the keep and the other buildings (chapel, vaults, stables, Women’s Toilets!) I made the climb down and back up those 180 steps. 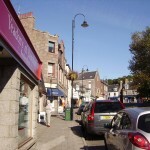 Before returning to Banchory, I drove through (sigh…because I got lost again!) 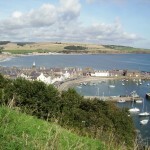 Stonehaven. It’s a lovely town with its harbor being one of the most photographed in the UK. Actually, it’s the photo for September on my calendar at home! Then, I drove on those wildy-curving one-track roads back to Banchory. Wednesday, I awoke to more sun so off I went again — this time only a couple miles down the road, first to Drum Castle and then to Crathes Castle. 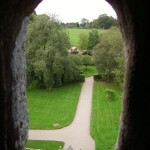 After touring the house, they let you tour the medieval tower on your own because. . . it’s a tower and there are lots of steps! LOL! As a matter of fact, once you climb into the main chamber, the great hall of the tower, you then climb a very narrow, very steep ladder-type of stairway up to the loft and then to the battlements overhead! 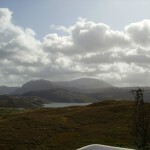 The view of the surrounding area is spectacular, of course. If you’ve read any of my books set in medieval times, you know I always love to have my characters up on the battlements. Many times, interactions of an intense, personal nature (ahem!) take place up there! I have a certain bit of fear of heights, but I love walking around battlements, the winds blowing, and I make the climb for the chance to walk them myself. This tower’s battlements are not the largest I’ve walked (the Tower of London is bigger, Duart Castle and Dunstaffnage Castle near Oban are, too) but it was impressive nonetheless! And, of course, then came the climb down — accomplished by going backwards down those stairs after ducking down to miss the stone ledge above your head…fun! With thanks to the National Trust of Scotland for the photo, this castle has been lived in by the same family for more than 350 years! As you walk through it, you go back and forth in the centuries as the castle was renovated for various generations and family needs. The family was originally granted the title of Royal Forester by Robert the Bruce. The gardens surrounding the castle are fabulous and you could spend hours just wandering among the various parts and paths, beautiful even now in the autumn. And, for those hardy souls who can still walk, the castle is set in woodlands with several paths of varying challenge levels clearly marked. Needless to say, I was all walked out by then so I did not accept the challenge. . . LOL! I finished off my evening with dinner in the hotel’s pub and a wee dram of Glenmorangie whisky, bought for me by a local man after discovering I was drinking, horrors!, water. . . It went down verra smoothly, but that’s a story for another time! Spending my weekend in Invermoriston – on Loch Ness – taking a couple of days to R&R and to, hopefully, get some writing done. BUT — the sun keeps coming out and I may have to get into my little blue Nissan and drive around a bit — to appreciate the Highland scenery in the sunshine since I’ve seen it in the rain. . . Byeeeeee for now…. On the Road Behind. . . and Ahead, too! I can’t believe I only have one week remaining in Scotland. It feels as though I just landed in the torrential rains in Glasgow and now I’m counting the days until I have to leave…. Waaaaaaa! So, where have I been these last few days since posting? Monday, I spent the day with an Orkney archeologist and it felt sooooo nice to have someone else doing the driving! And I felt like all I did was pick her brain – about history, about archeology, about Scotland, about everything — and it was wonderful. Actually, right next to the ruins of the Earl’s Bu and the Round Church, is the Orkneyingasaga Center — and they have a wonderful display of the genealogy of the Earls of Orkney and they’ve used faces we would recognize! I was reading across the chart and wait! That’s Mel Gibson, Nicholas Cage, Bruce Willis, Sean Bean, Robert DeNiro and more! Too funny — but it makes following the Thorfinns, Magnuses, Haralds, Pauls, and Sveins much easier and fun. The archeologist also told me that the ruins in the photo are probably not the real drinking hall of the earl because they’re WAAAAY too small. 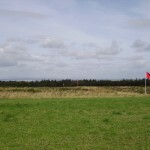 They want to excavate the larger field next to it and think the real one is there…. Hey, these Vikings could drink! Next, because the tide was out, we walked across the tidal causeway to the Brough of Birsay, the original center of Viking power in Orkney. This causeway fills with water, separating the island from the mainland for half of each day and making planning of tours verrrrrry interesting! Lucky for me Caz both lives in the area and is very careful about that timing. Gotta say – it’s very strange walking across the sand and stones and then the algae-covered concrete walkway to get to the ruins of the Viking settlement and monastery. But, oh gosh, so worth it! 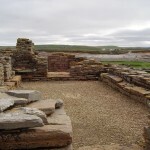 This monastery lasted until the Norse decided to make Kirkjuvagr or Kirkwall their new capitol and the then earl moved across to the other side of the Orkney mainland. So, the wonderful round tower planned as an addition to the chapel was never built and the earl and his family moved far away to the other side of the island. 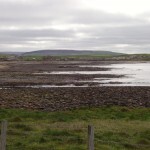 The church on the mainland side of the causeway is the location of St. Magnus’s original burial but his bones were moved to the cathedral named for him in Kirkwall. And because of some special foresight, his bones had been placed inside one of the pillars rather than before the altar (FYI – usually the place for burying saints when one buries a saint) sparing his bones from desecration and destruction during Henry VIII’s dissolution of the monasteries. We walked back across the causeway (did I tell you it was about 1/4 mile each way?) 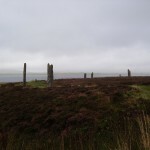 and our next stop were Standing Stones — first Stenness and then the Ring of Brodgar. 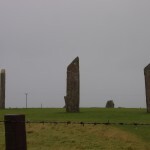 These are two different stone rings — Stenness had about 12 stones originally (along with the famous Odin’s Stone) and Brodgar had about 60, along with its Comet Stone). They are both impressive as you walk around them, the size, the amount of work needed to raise them, and the importance of such sites all strikes you as you pass the stones. BTW – the Odin’s Stone was known for its curative powers and it was the place to solemnify oaths, such as marriage! 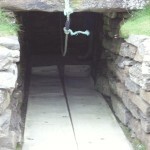 People traveled from all over Orkney to pass their newborns through the hole in it to protect them from illness and death. Oh!! 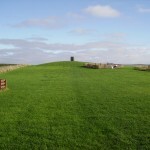 Maeshowe has some of the best graffiti on record – in this case it’s in runes and has been dated to the 12th century, though the tomb has been used by several different populations throughout history. Claims about a woman’s beauty and who slept with whom (several men with a certain beautiful widow apparently) as well as a man boasting that he was the best rune carver in Orkney are included in the clearly-visible carvings on the walls inside the chamber. 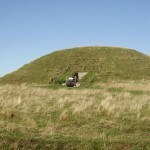 And to finish out the day in a spectacular way, Caz took me to Minehow, another burial mound with a chamber – if you can call it that!! First we donned hard-hats and she took out her ‘torch’ and unlocked the door leading to the steps. Okay – first, maybe I should mention that I am claustrophobic and can’t ride backwards? The steps – 29 in all – go almost steeply-down, curving around in one direction and then in the other and then end with a 3-foot drop to the bottom of the chamber. Luckily I just kept following Caz’s instructions or I would have been frozen in place! There is barely enough room to fit down the steps. . . and I had to keep my eyes on the steps beneath me while holding on to the rock ledge for balance! Oh yeah! Once down at the bottom, after I made myself breathe calmly, the chamber was spectacular! How and why anyone dug this out of the rock, then formed the chamber and the steps (along with 2 side chambers which I could see on the way up) is still unknown but it must have been important to do it. So I had to do it, too! BTW — on my first trip to Scotland I bought a beautiful necklace from Sheila Fleet jewelry and it turns out it modeled after a brooch found in a burial mound next to Minehow. This is what it looks like! And yes, I bought myself a new necklace to mark this trip!! Okay — the hotel pub is filling with locals and I need to pack up some books to ship home, so I have to stop now. . . but I’ll be back tomorrow….or really late tonight to tell you about the castles. . . .Dunottar, Drum and Crathes. Oh!! I forgot the best news of all — the sun was out yesterday for a few hours (while I was at Dunottar) and then all day today while I toured Drum and Crathes and got lost (again) looking for a stone ring somewhere nearby . .. THE SUN!! Now, Where Was I? Oh, Still in Scotland. . . I spent Thursday morning at Culloden battlefields — walking the perimeter and visiting the new center where they even have an ‘immersion’ room. There, you are placed in the middle of the pitched battle — soldiers from both sides attacking, shooting, fighting, dying…. I found my throat tight and tears burning my eyes as the battle roared around me. Wow…. 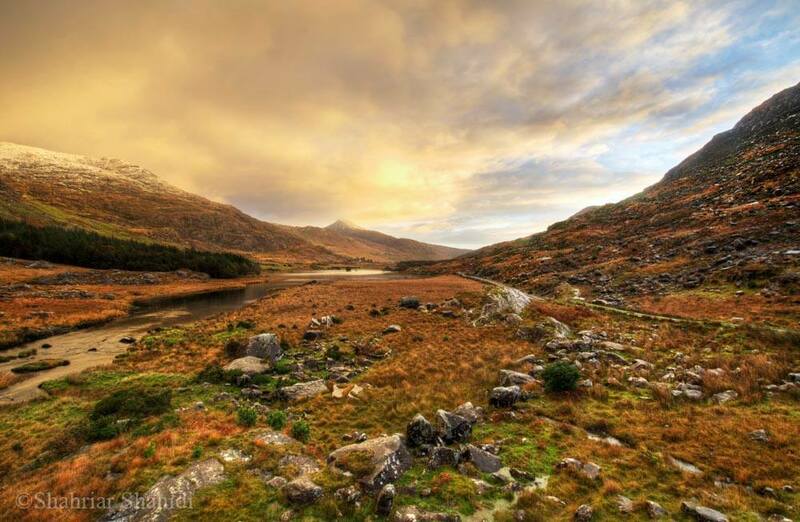 Once you visit the site, you know that Bonnie Prince Charlie was a fool for ordering a battle in such a place — expecting his exhausted forces to run across a boggy field in heavy rain against a well-rested, well-fed army. IMHO – of course…. After spending a couple of hours there, I ‘hit a wall’ and found that sleep was the thing I needed. 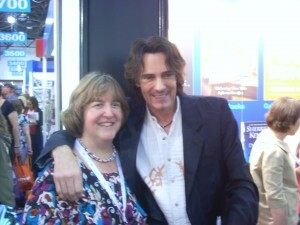 Especially since I wanted to be awake for the Dougie MacLean concert that night. Which was. . . .
Fabulous! The show opened with more local young Gaelic performers who were awesome and then Dougie took the stage. He taught us new songs, urged us to sing along, explained his history and his inspirations and entertained us. And he told us that he’d been a guest of honor when hundreds of pipers played his song CALEDONIA – the anthem of the Homecoming Scotland year…. Friday found me back on the road — this time heading north to take the late ferry over to the Orkneys. Up the A9 along the northeast coast, past castles (Dunrobin), standing stones, cairns, dramatic scenery and twisting turning roads. I wanted to post photos but the ‘loader’ isn’t working now…. darn it! I stopped in Wick at a Tesco’s and found my book on sale there! POSSESSED BY THE HIGHLANDER — I got a photo of it and with it which I’ll post when this darn thing works…. but it was very cool seeing it out in the world. Possessed by the Highlander in Wick's Tesco! 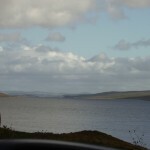 I took the 7pm ferry from Scrabster over to Stromness and arrived at the guest house around 9:30…. The sun was setting to our left as we made our way across the Pentland Firth and past the Old Man of Hoy stacks to the harbor. Today I drove down to the southern end of the ‘mainland’, across the Churchill barriers, past Scapa Flow, to visit the Tomb of the Eagles. 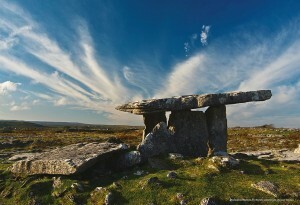 This is a Bronze-age dwelling and a Stone-age tomb where they found human and sea eagle bones, hence the name. 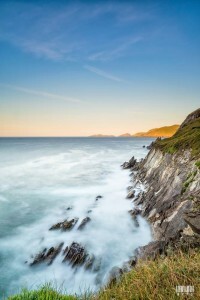 But, to get to this cliff-hugging site, you walk more than a mile across the hilly farmland to the rocky edge and then…. you crawl down a narrow passageway to the inside of the tomb. Yes, you read that correctly — crawl down!! Tomb of the Eagles entrance! They have a little wooden trolley cart that you can lie on and pull yourself inside along a rope, but I kept steering that into the walls!! So, with the help of some rubber knee cushions and the cheering of some other tourists, I crawled on in. It was eerie inside — they excavated dozens of human skulls (hundreds of bones), jewelry, tools, and sea eagle bones and talons, hence the name of the tomb. This tomb was in use for almost 1000 years before the people moved away…and all this happened about 4500 years ago! It was awesome. So, I’m getting packed because tomorrow is busy — first I’ll spend the day with an archeologist touring all over the place and then I’ll be taking the overnight ferry from Kirkwall to Aberdeen, arriving there at 7:00am on Tuesday! Even though I’ve done it quite a bit, it is still unnerving to drive my car onto a ship….and to see huge busses and tractor-trailers and trucks doing it too! I just try not to think too much and focus on the scenery…. LOL! Gale Force Winds, Downed Trees and Mudslides – Oh MY! I know now that I picked the best day to go out on the ferry to Harris/Lewis yesterday/Monday — because today/Tuesday a strong low pressure system came off the north Atlantic bringing gale force winds to much of north and western Scotland. I left Skye during the worst of it and fought to keep the little car on the road all the way to Inverness! 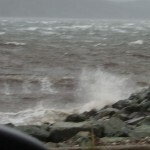 Can you see the whitecaps in the background from the winds? Oh yeah! I have to walk down-where?! 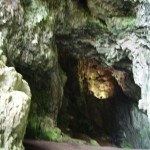 The path down to Smoo Cave! Gosh, this trip is turning out to be so much better than I ever hoped — I was getting panicky in the last days before I left about being on my own and driving and all kinds of worries about traveling solo, but so far, it’s been a wonderful experience…..I’m glad I tried it…!